Disneyland Paris is celebrating its 25th anniversary with new entertainment options, special merchandise, and even special food and drinks. Star Tours: The Adventures Continue opened at the park 25 years ago and as part of the celebration it features a new experience, a new pilot, new characters, and 3D technology. Guests will have a chance to meet Darth Vader every day at Disneyland Paris at a new area near Star Tours. The park is also celebrating with a new parade – Disney Stars on Parade. This new experience features new floats, new music, characters in new costumes, and more. 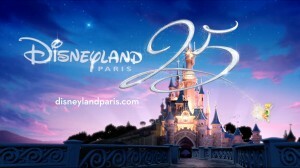 The 25th anniversary celebration also features a new stage show, Happy Anniversary Disneyland Paris. This show was created for the 15th anniversary. Another new show, The Starlit Princess Waltz, features Tinker Bell, Aurora, Ariel, Belle, Snow White, Cinderella, and more. And guests can end the night with Disney Illuminations, a new show featuring lights, projections, fountains, and pyrotechnics. Later this year Space Mountain will become Star Wars Hyperspace Mountain as part of the 25th anniversary celebration.